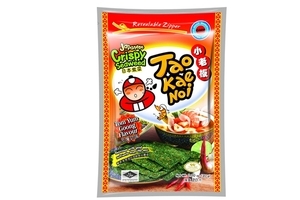 Tao Kae Noi Crispy Seaweed Tom Yum Goong Flavor in 1.41oz (40g) resealable bag. Crispy Seaweed in Thai Hot and Spicy Tom Yum Goong flavor. TaoKaenoi Crispy Seaweed is manufactured with the most state of the art technology and finest quality machinery. The process ensures the highest standards of hygiene and freshness, whilst preserving its crispiness and natural taste. Packed full of goodness, you can enjoy our seaweed anywhere, anytime, be it at play, at work or while you are traveling. TaoKaeNoi Crispy Seaweed can be consumed as a snack or as a supplement to your meals, with rice, in sandwiches, with soup, or on its own it is simply irresistable and delicious. Product of Thailand. • Manufactured under the GMP (Good Manufacturing Practice) standard. Shirakiku Ramune Carbonated Drink (Grape Flavor) - 6.76 fl oz.